Every month PPTC holds a Pub Run. It is usually on the last Wednesday of the month. Last month’s run started with the group meeting at The Double Windsor at 7:15pm. After a quick group photo, we ran a loop of Prospect Park. There was no official pace breakdown of the group, but like all of our social runs, there are a variety of paces, ranging from 8:00 min/mi or faster to 13:00 min/mi or slower. Tonight’s Pub Run was lead by Caitlin-Marie Miner Ong. Anja Kremzow ran with me at the back of the pack. Our average pace for the run was 13:15 min/mi. Thank you, Anja, for running with me. As a back of the pack runner on a destination run, I sometimes feel a little left out arriving to a location later than most of the other runners. However, the beauty of the Pub Run is that it doesn’t matter if you’re slow or fast: Everyone ends up back at the pub (and arriving at different times to a pub is normal). Also, the run is relatively short, so the difference in time from the first runner to the last runner is usually no more than 10-15 minutes. I’ve been going to the Pub Runs since I joined PPTC in September, and I have never felt left out. The Pub Run is ALL INCLUSIVE, even if you aren’t actually running. Injured and can’t run? Wednesday is your rest day, so you won’t run? Work too late into the evening to make it by 7:15? Don’t worry about it. Just come to the pub. We had plenty of people join us tonight who didn’t run. 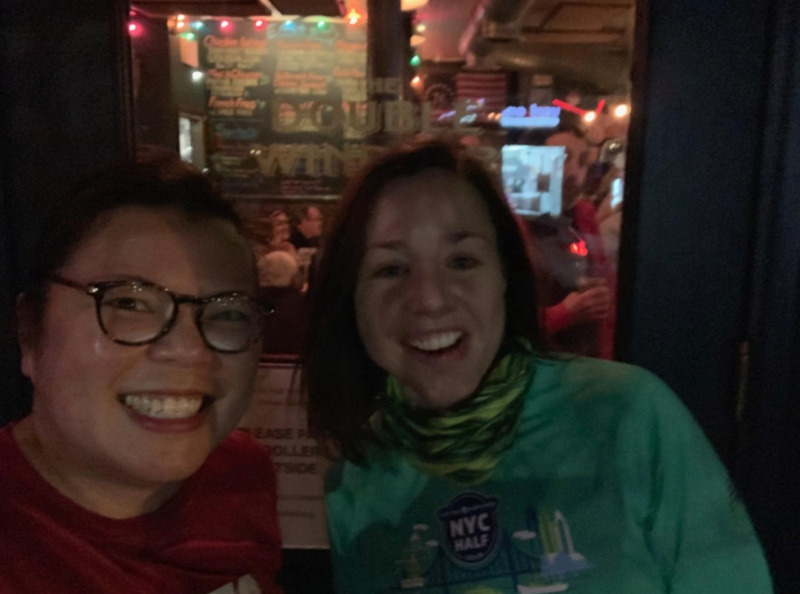 Also, even though it’s called a pub run (and the run starts and ends at a pub), don’t feel like you won’t fit in if you don’t drink: You can have a soda or water and just chat with your teammates. The Double Windsor actually has a pretty good menu, and the food is above average for pub food. I had some mac n’ cheese and a steak sandwich with fries. I didn’t take photos of the food, but sometimes my stomach wins over my Instagram feed. Wednesday night may not be the best time for a lot of people to come out. You’ve had a long day at work. But what better way to get over the Wednesday hump than to come out for a run and some socializing? 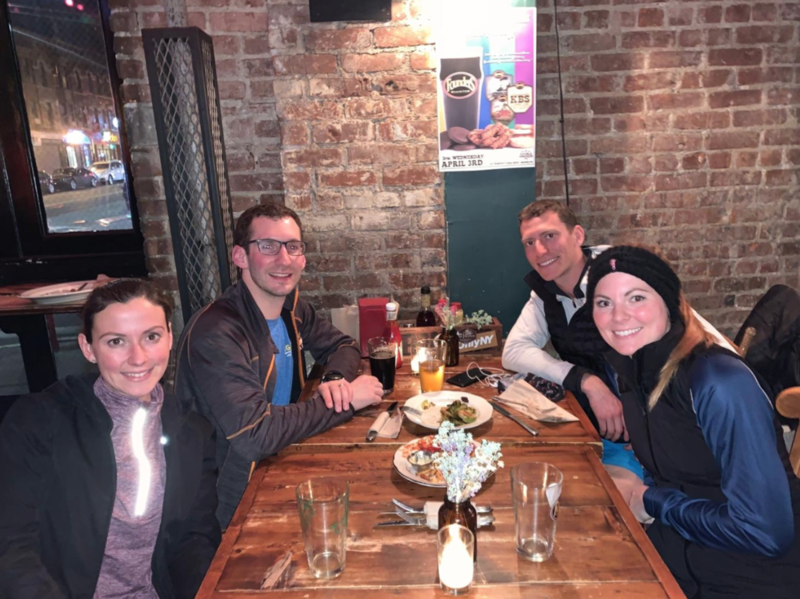 Details of the Pub Run are usually posted on PPTC’s Facebook page and other social media channels, on the PPTC website, and in the Speed Read. Please join us in April. I look forward to seeing you!